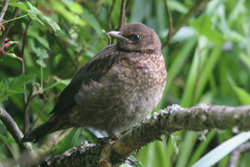 This report details the birds observed around the Field Studies Council's Kindrogan Field Centre near Enochdhu in Strathardle, Perthshire in early June while working on an undergraduate field course. The field centre is set in an old Victorian estate with a small area of mixed woodland along the banks of the River Ardle at the foot of Kindrogan Hill, largely cloaked in spruce forestry plantation with smaller areas of larch. Strathardle is dominated by pastoral farmland in the glen and moorland on the higher ground. Imm on Straloch Loch 5/6. 3 on Straloch Loch 5/6. Singles along the River Ardle most days. One calling at 0315h on 7/6. 2 prs on Straloch Loch 5/6. B/5 in roadside burn, Pitlochry 4/6; Pr on River Ardle, 2 mm in Loch a Choire, Ben Vrackie 4/6. Not seen around Kindrogan. Seen from train on pool nr Gleneagles. Pr on small lochan beside the Enochdu to Kirkmichael footpath (Cateran Trail) 6/6; Pr + 2 mm on Straloch Loch 5/6. Female flew upstream over River Ardle 5/6. One from the train between Stirling and Gleneagles. Female in Lime in car park 3/6. Regular over field centre; up to three regular over Enochdhu; 3 over Kirkmichael 6/6. Not seen around Kindrogan. Seen from train between Pitlochry & Gleneagles. One flew east over the field centre at 1240h on 3/6. Pr with brood of young on Ben Vrackie 4/6, another two birds near loch; also heard between Kindrogan and Pitlochry..
14 mm lekking at one site. Fairly common in pasture. One calling at 0314h on 5/6. 1 on Straloch Loch 5/6. Two adults in roadside garden ponds, Pitlochry 4/6. Several pairs along the River Ardle & Brerachan Water. Vocal throughout the night. Not seen around Kindrogan. Several from train near Gleneagles. Roding bird along main drive at 0339h on 6/6; 0350h on 7/6. Heard calling from Moulin Moor on 8/6. 2 displaying over Kirkimichael village 6/6; 5 displaying on Moulin Moor 8/6; several on Ben Vrackie. Vocal before 0300h. Pair on River Ardle near field centre. Regular over Strathardle. Probably nesting at Curran. Noted at Enochdhu, Kirkmichael & Pitlochry. Male mobbed by Stonechat in Glen Brerachan 1/6; one singing & mobbed by Mipit at top of Kindrogan Hill 3/6; 3 singing mm on Moulin Moor 8/6; singing bird nr Straloch. Singing nr field centre from 0315h on 5/6. Males heard calling from Kindrogan Hill & Enochdhu. Birds observed in clear fell near the graveyard, along the River Ardle, and in the field centre car park. Juvs heard calling from Kindrogan Hill at 0300h on 5/6. One mobbed by Chaffinches & Blackbirds nr Kindrogan Crag 7/6. 2 over Kindrogan house 2/6; 4 on 3/6; several over Pitlochry 4/6; 10+ over Kirkmichael on 6/6. Regular at feeders. Single or pairs noted at field centre, curling pond, East Lodge & Enochdhu; juv on roof of Ardle building 5/6; one calling at 0324h on 5/6. Drumming heard at curling pond. Several singing males in Glen Brerachan. 3 at Straloch 5/6; 1 at Dalreoch 6/6. 12+ at Straloch on 5/6; 20+ Dalreoch, Enochdhu. Common in Pitlochry; 4 at Straloch 5/6. Displaying birds in birch woodland patches in Strathardle & Glen Brerachan inc clear fell at graveyard. Abundant in Glen Brerachan, Moulin Moor & Ben Vrackie. Juv on River Ardle at the front lawn 2/6; juv at Enochdhu on 2/6; 3 juvs on track at East Balnald 5/6; pr Kirkmichael 6/6. Pr nesting in pipe at field centre, 2 prs at Straloch. Two territories found around field centre & Enochdhu. Juvenile on River Ardle at walled garden. Common. Singing from 0341h on 6/6. Also singing close to summit of Ben Vrackie. Scarce - only singing birds at West Lodge. Also in Pitlochry. Common. Singing from 0311h on 6/6. Singing male in thick heather, Moulin Moor 8/6. 2 juvs on walk up Ben Vrackie 4/6. Several on Ben Vrackie, Pitlochry. Male at usual site on Ben Vrackie 4/6. Very common. B/2 on 2/6. Singing from 0331h on 6/6. Common. Singing from 0314h on 6/6. One bird incorporating GS Woodpecker 'kick' call into its song. Common. Bird carrying food for young on 2/6; ad + 2 juvs Enochdu to Kirkmichael footpath (Cateran Trail) 6/6. Singing male at West Lodge 5/6; singing male along the Enochdu to Kirkmichael footpath (Cateran Trail) 6/6. Several singing mm. Singing from 0359h on 6/6. Several singing mm. One singing at Pitlochry station 1/6, 8/6. Singing from 0347h on 6/6. 5-6 singing mm around the field centre. Singing from 0352h on 6/6. Very common in coniferous forestry. Singing from 0335h on 6/6. 5 singing mm/prs around the field centre. Singing from 0322h on 6/6. Fairly common. 22 (mostly juvs) at curling pond 5/6. Common. B/3 in larch wood nr curling pond 5/6; two pairs in beech wood by the house. Singing from 0352h on 6/6. 1-2 around edge of clear fell at graveyard 7/6. Only seen at Kirkmichael village. 7 prs nesting in chimneys in Kindrogan house. 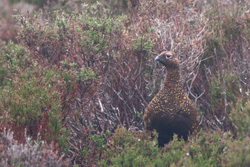 Rookery in Glen Brerachan and common in pasture in Strathardle. Up to three regular over Kindrogan Hill. Singles regular elsewhere. 2 at Straloch 5/6. Common in Pitlochry (mimicking Curlew). Birds collecting nest material at Moulin Hotel. Also partial albino here. Abundant. Singing from 0351h on 6/6. A few pairs/singing mm noted. 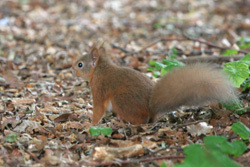 Fairly common in coniferous woodland. 25 Kindrogan Hill 3/6; 10 over East Balnald 5/6. Pr along Enochdu to Kirkmichael footpath (Cateran Trail) 6/6. Noted in conifer patches in Glen Brerachan. 5 over curling pond 1/6; 2 over walled garden 3/6; pr feeding on top of Kindrogan Hill 3/6; 2 over field centre at 0446h on 7/6, several passing Kindrogan Crag on 7/6. Prs noted at the walled garden (2), curling pond & Davan. Singing male at small lochan on Enochdu to Kirkmichael footpath (Cateran Trail) 6/6.